Hundreds of people have lined the streets of Tokyo for the visit of Donald Trump. The American president is in Japan at the start of a marathon 12-day Asian tour. Trump began the trip with a warning to North Korea over its nuclear programme. But his first day ended with Spiny lobsters and beef steaks at a teppanyaki restaurant where he was full of praise for his hosts. 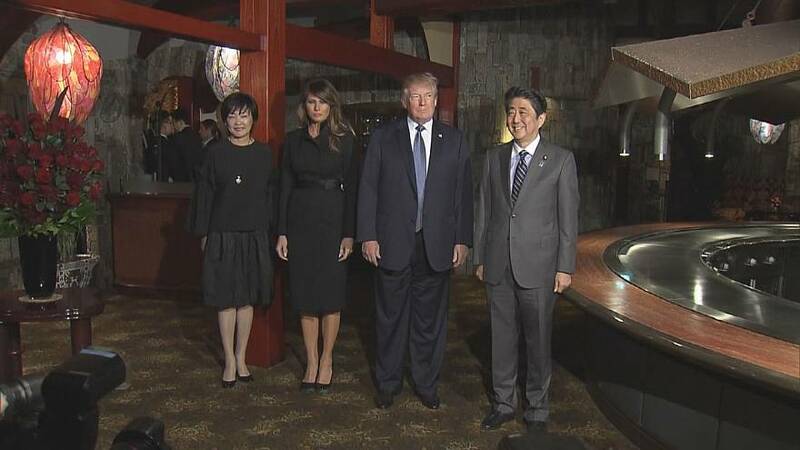 Earlier, Trump and Japan’s Prime Minister Shinzo Abe played a round of golf with Japan’s top golfer, Hideki Matsuyama. the two leaders, fostered by several meetings that included a round of golf in Florida earlier this year. Trump’s tour, the longest by a US leader in 25-years, will also take him to Vietnam, the Philippines, China and South Korea.